The "bugmenot" account has been closed. There had been many anonymous posts in the recent past using the "bugmenot" account and people didn't even leave a nickname or anything, which made replying more complicated and this forum more anonymous. Both things that we do not want, so we've closed the "bugmenot" account, now. Please note that for a single, quick question or issue you can post as guest without registering in forum "General". 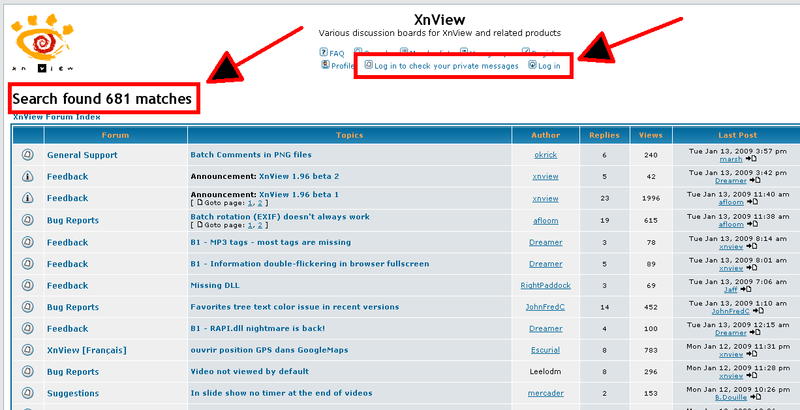 If you want to reply to existing posts and be (a bit) more active, please register to the XnView forum. Registering to the XnView forum is free, simple, spamfree, and still anonymous. New bugmenot accounts for the XnView forum will be closed without further notice. because your definition of 'easy and fast' is wrong. and needs confirmation is not easy and fast. easy and fast would be choose a name and pw, no email needed. I can afford to signon because I have a domain and can give every forum a unique email - I get 0 spam. Others get spam but have given their email out everywhere so can't change/trace the leaks. also since u can't search, guests will mostly give up (90%) and the last 10% will post dupe bug reports in general that you have to clean up. As far as email addresses are concerned, there are a lot of throwaway email sites floating around now. People who are concerned about getting spam can easily use one of those sites. Some of them require the extra step of choosing an email name before trying to use it, but many offer instant creation, just make up an address & use it somewhere. Bugmenot is a great tool for obnoxious sites that try to force you to sign up for no legitimate reason (ny times website for example), but it just doesn't make sense for forums. you can't search as a guest. This is what the topic is about. Log out and try it before going after someone. if I hadn't used Bugmenot for this forum for a few weeks and found it useful, I wouldn't have signed up. and neither will many guests who have now little access. Most will post their bug once and never return. I had already tried searching as a guest before posting my reply obelisk, it works just fine. There's an "bugmenot" account r7pkz8sctjn6x90 that has been taken over by spammers. The homepage and signature of this account has been changed to point on spam site. ckv wrote: There's an "bugmenot" account r7pkz8sctjn6x90 that has been taken over by spammers. The homepage and signature of this account has been changed to point on spam site. Thanks for reporting, ckv. That misused bugmenot account is closed, now. bugmenot accounts are still NOT wanted here - registration is for free and reading and searching this forum is possible without registering.